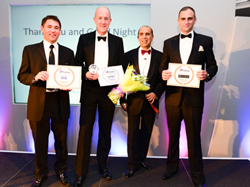 The winner of Coras 2014 business competition was announced at the annual Gala evening on 1st May at the Hilton Newbury Centre Hotel. Local business LevelX.info was awarded the winning prize of £1K cash, 12 months business mentoring and an opportunity to tap into a £25K investment. LevelX.info was established by Steve Ardagh-Walter and aims to provide advanced warning of level crossing times for drivers with a pilot project for Thatcham’s level crossing. This level crossing combines over 120 trains per day and heavy road traffic with over 3,500 vehicles. While trains pass freely at speed or stop at Thatcham station, large numbers of vehicles can queue for up to 20 minutes at a time waiting for the level crossing gates to open. LevelX.info will tell drivers when the gates close before they start their journey via smartphone apps, Twitter or a website. 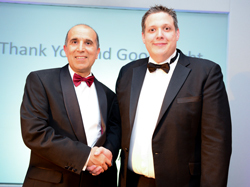 One of the runners –up, Gareth Ward of Environmental Solutions, gave very personal and emotional presentation on what inspired him to start his own business and how he found an opportunity in the market place. 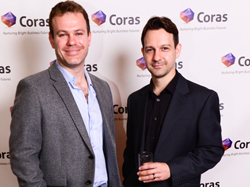 Neil Shuttleworth of Special Auction Services, another Coras finalist, entertained guests by creating an auction environment during his pitch. His level of energy and enthusiasm was passed on to the audience who gained an insight into his varied business activities. 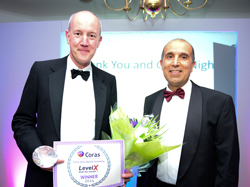 LevelX.info – The Winner of Coras 2014: LevelX.info will provide advanced warning of level crossing closing times for drivers, letting you plan your journey to avoid delays. Launches in June. Environmental Solutions: Established in 2005 with a view to continually re-invest, develop existing services and become a specialist waste management company, Environmental Solutions have real passion to outrival the competition. Special Auction Services (SAS): Sell your Antiques & Collectables through the Specialist Auctioneers with the best track record.